This tweet thread has some great information on Twitter Search. In order to help me find it in the future, I’m creating this post for my own reference. In the interest of avoiding posting duplicate content, this post is marked no index for search engines. Just type it into a search box. Ever want to find a tweet from someone in particular? from:username — for all tweets from that person. After the username you can enter search terms to get tweets from that person including those words. Trying to find a tweet that was sent to a person? to:username — for all tweets mentioning that person. Like with from, you can add search terms. 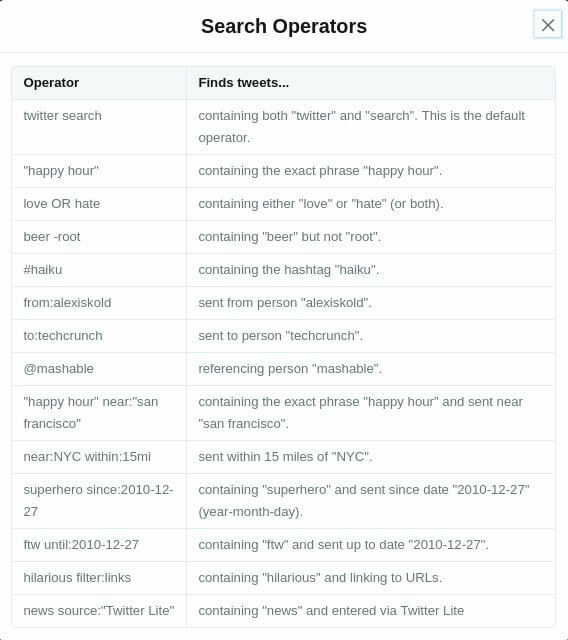 You can also combine these searches to find all tweets from someone and to a particular person. filter:replies This will give you only reply tweets. filter:retweets This removes retweets from search results. min_faves:10 will show you tweets with 10+ likes. You can use whatever number you wish. These can be used and combined to allow you to find information/tweets very quickly. You don’t have to scroll down someones profile trying to find something. This works for the app and the website. "United States" would find the exact phrase. Dr -Pepper would find Dr without Pepper. hot OR cold would find tweets with hot or cold. It will find news with the tweet containing that search term. Want to find tweets with a minimum amount of retweets? I didn’t include this one previously because I found it wasn’t very reliable when mixed with the from:username filter. It seems to work well outside of that. This is for searching for tweets from people on a list. This one you would just want to bookmark after you search it or add it to a saved search. You have to manually go to the profile to find the list name to set it up. Name is in URL.